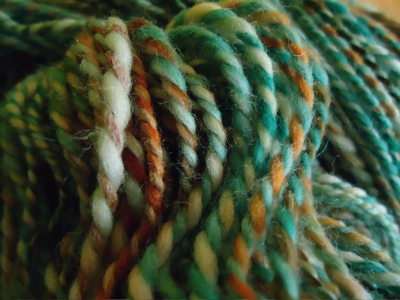 This stuff was so soft and pretty that I had to take a few pictures before I set the twist. I snapped these while I waited for the sink to fill up! This is 211 yards of squishy, soft, light worsted-weight 2-ply spun from Pigeonroof Studios merino in the chard colorway. I am in love. 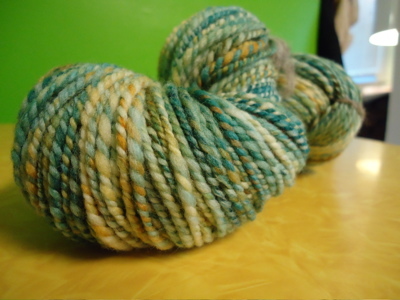 I haven’t spun merino in awhile, and returning to it felt luxurious. Just what I needed this week. Also, I’m almost to the feather and fan section of my hemlock ring. I’m really enjoying this, and I’m planning to sit down with this before today’s soccer game. I think this project is helping me to rebuild my lace confidence — I’ve had to rip back a few times to catch small errors, and being able to read my lace and solve my stitch count issues feels really good! Also, I put just a little bit of ice cream in my coffee this morning. Clearly a good move. Happy Sunday! This entry was posted in knitting, spinning and tagged 2-ply, chard, ecowool, FO, hemlock ring, lace, pigeonroof studios, spinning by barefootrooster. Bookmark the permalink. Merino is wonderfully soft and I know what you mean, whenever I spin it I wonder why I don’t do it more often. 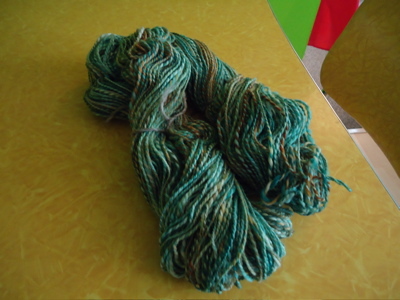 That colorway is gorgeous – I hope you make something for yourself with it. Love the chard! I’m now stash diving for merino to 2 ply into squishiness like yours. Don’t you just love Jared Flood! Good for you for “reading” your lace. OK. It’s now official. You are brilliant. I just added some vanilla ice cream to my coffee and Sunday has become even better than before. Beautiful ‘Chard’! Your Hemlock Circle is gorgeous! Ice cream in your coffee made me smile. It is awfully out out there! Happy Sunday to you too! Wonderful yarn! Also, seeing all that beautiful handspun here on your blog has inspired me to start spinning again! The first hank of Merino is now drying and I’m currently spinning the rest of a combed top called ‘Space’. Happy Sunday! Um, I think I want to eat your yarn. Just saying. Yay for lace progress! It just takes practice … and that Hemlock Ring is going to be soooo cozy for winter. 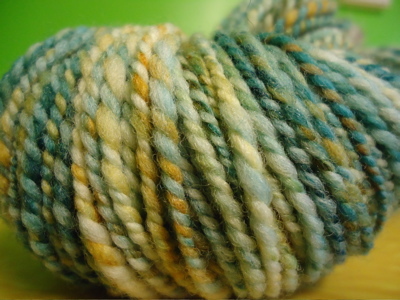 Oh, the handspun is just gorgeous! 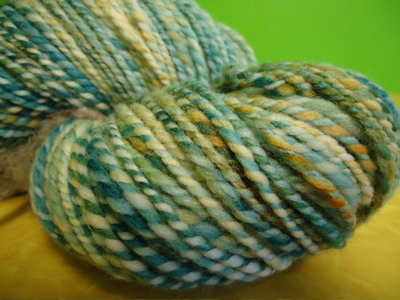 You’re making me want to take up spinning (which I shouldn’t do b/c I don’t have the room or funds for another hobby!). Hemlock Ring is looking great. It just hit me yesterday that we’re doing this mini KAL at a crazy time of year — Eco Wool blanket in the middle of July?!? Oh well, I’m still really enjoying it, I just need to work on it downstairs while enjoying an iced tea or cold beer. 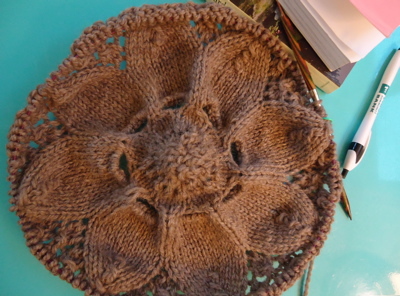 BTW, I think that the lace pattern for the center was a bit tricky. YOs at the beginning of needles always freak me out. I LOVE the squishy!!!! It is beautiful! Love the handspun! If it was that squishy before its bath, I can only imagine what an amazing pillow of yarn it turned into afterwards!